You might have heard of Lok Sabha but have you heard of Log Sabha? 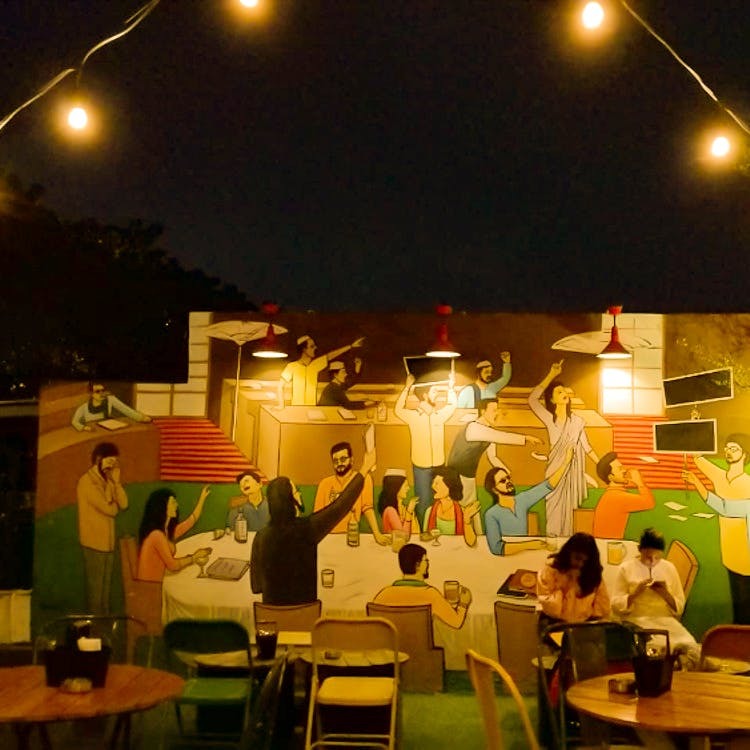 Yup, Film Nagar has a parliament-themed rooftop bar on Moonshine Project where graffiti of netas embrace the walls. Holy moly is what we have to say about the graffiti at Log Sabha where politicians are getting comfortably unparliamentary (Erm!) and getting caught on Breaking News. With quirky captions like #UlluBanayega and #SabKiPhategi, trippy fairy lights, and a caravan bus, we found ample corners to Instagram. We hit Log Sabha on a Friday evening, sat under the stars (Yup, really), and asked for Singapore Seek Kebabs and Nachos to start with. Dawdling service can really test your patience but hang on. The kebabs were deliciously tender but you can skip the nachos as they weren't served with fresh salsa or authentic sour cream. What arrived next were Schezwan Noodles (Can be shared between 3-4 people) and while we thought it was funny to find red chillis in them, we enjoyed the dish with our chilled beer. End your meal with churros and groove to those Honey Singh tunes. Or not. Either way, grab those beers and cocktails and unwind amidst this bizarro vibe. It's worth it. Most of the dishes are pretty average and they really need to work on it.